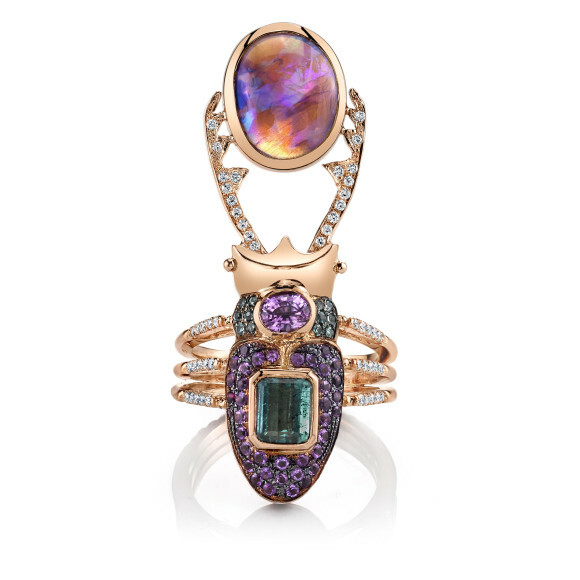 While I am not a fan of the creepy crawlies, I must admit there is something really charming about Daniela Villegas‘ jewels. 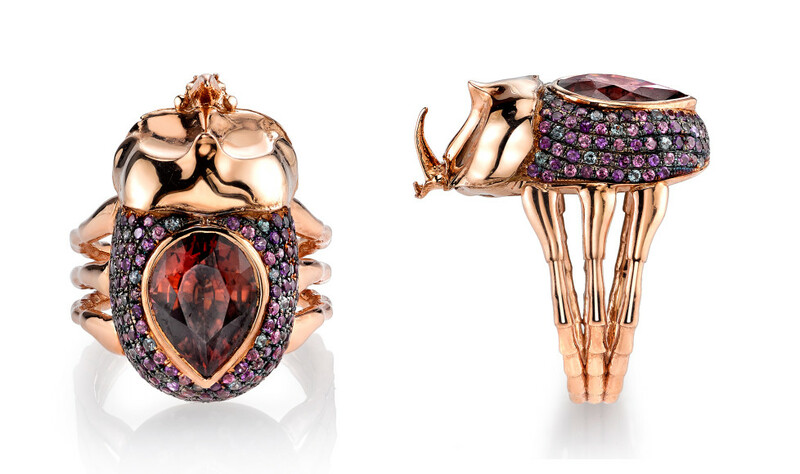 Beetle-Jewels to be precise. 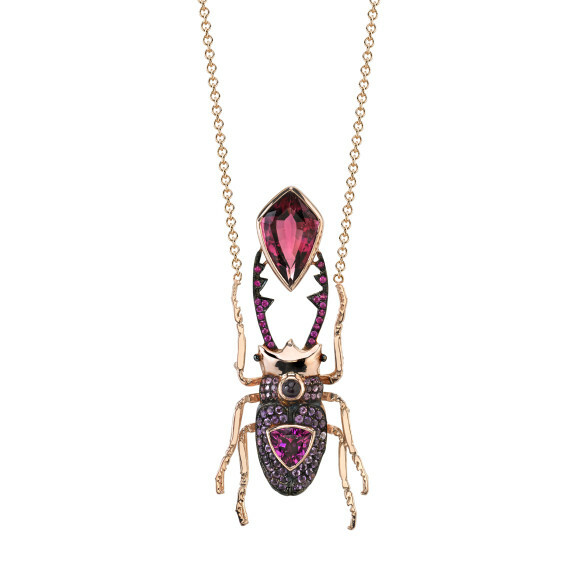 Villegas’ pieces are quite lovingly inspired by nature and very cleverly executed with vivid arthropod-like gemstone bodies, sparkling pave antennae and glossy, gilded limbs. 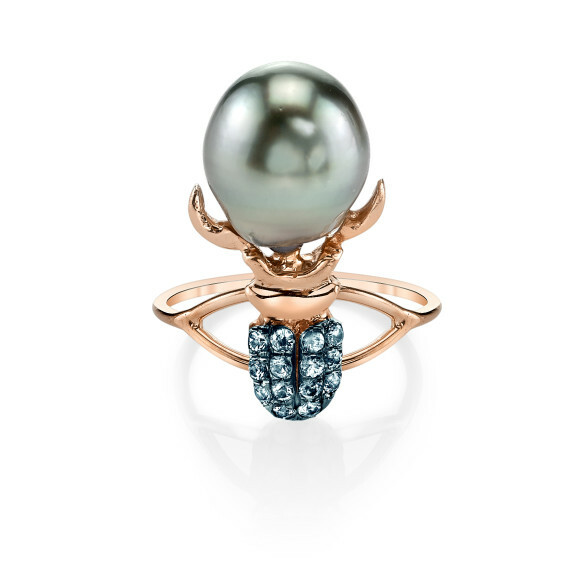 Rich, glowing finishes mimic actual insect wings while carefully detailed legs clutch giant pearl treasures in their tiny claws. 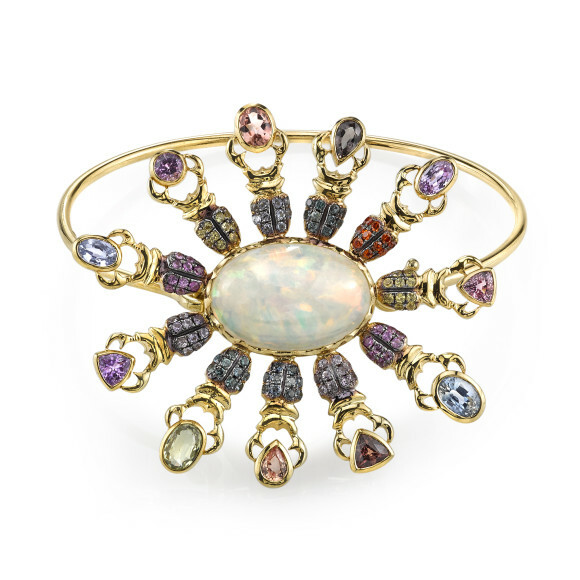 The sheer brilliance of Villegas’ color palette is a testament to her love of nature and rainbows, which she readily admits bring a sense of peace and joy to her soul. 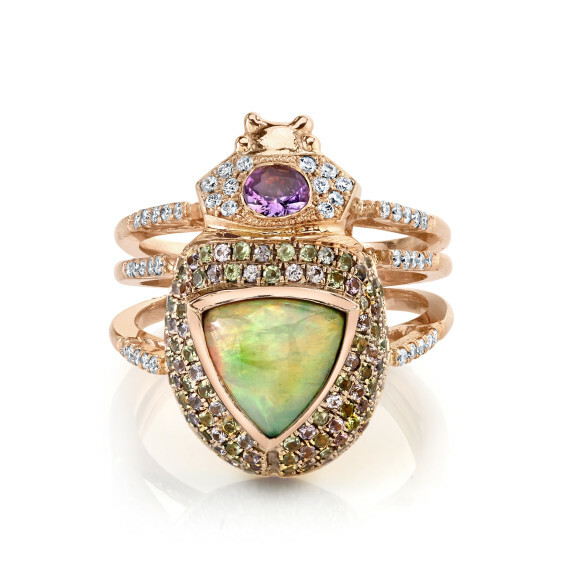 Her preferred gemstone is the opal, precisely for its natural aurora borealis appearance. It’s also no surprise that her favorite insect is the Scarab Beetle, and no-pun-intended here, the Buprestidaes, or known by its more pronounceable name, the Jewel Beetle. Shocker! I must admit that when I come into contact with real live insects the hair stands up on the back of my neck and I get weak in the knees. But Villegas’ pieces make me weak in the knees for a whole other reason. They’re spectacularly beautiful and totally respectful of nature. 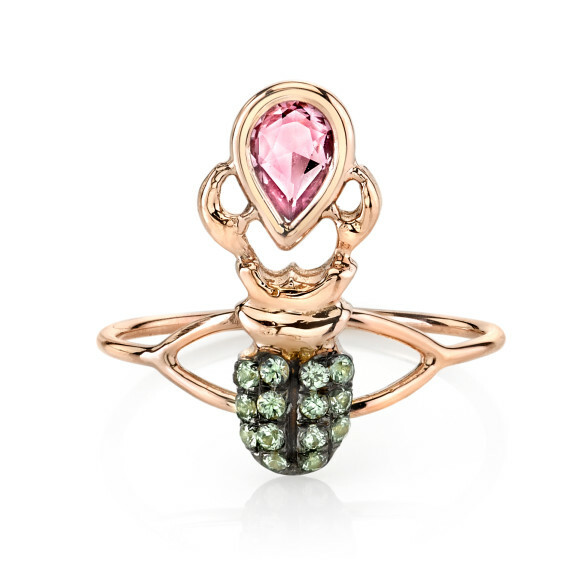 Rather than appearing pastiche and silly, which sadly many insect and animal themed jewelry can veer towards, Villegas’ pieces are acutely accurate and completely elegant, almost worthy of a double-take. 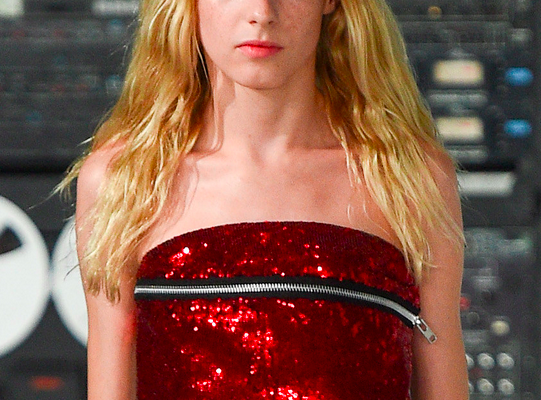 It’s as if they exist as she’s created them, only to remain bejeweled and frozen in time. 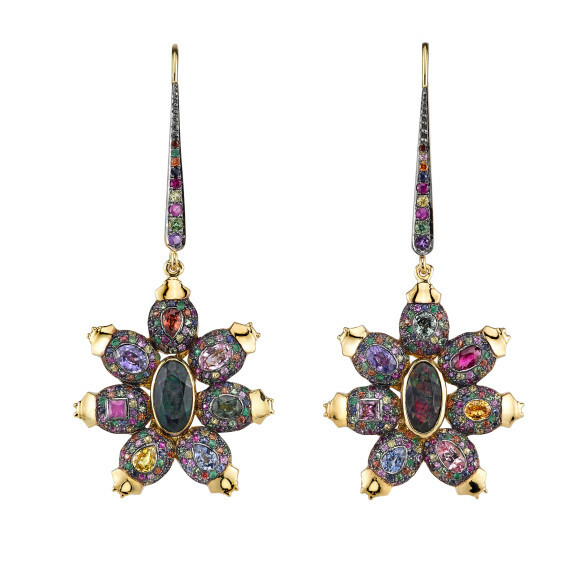 Daniela Villegas is currently available at Net-A-Porter, The Alchemist, Ikram & Bergdorf Goodman.